Campingplass Le Lac de la Liez er en campingplass i Peigney, Haute-Marne, som ligger ved innsjø/vann. Denne terrassecampingplassen og campingplassen med skrånende terreng har steder med avgrensning, med skygge, uten skygge og plasser med noe skygge. Camping Le Lac de la Liez ligger i nærheten av en sandstrand. Det er mulig å leie stasjonære campingvogner og hytter. Campingplassen har lekeplass og idrettsplass. For sportslige feriegjester arrangerer campingplassen ulike sykkelturer. Det er underholdningsprogram. For dem som vil slappe av etter en travel dag er det sauna og boblebad. Campingplassen har badeland, utendørs svømmebasseng, oppvarmet innendørs svømmebasseng og barnebasseng. Det er også vannsklie. I nærheten av campingplassen kan man svømme i en innsjø/vann. Ved Camping Le Lac de la Liez kan man drive med vindsurfing og vannskikjøring. Det er ikke alltid nødvendig å lage mat selv, for på campingplassen er det pizzeria og restaurant (med omfattende meny). På campingplassen kan man også kjøpe nybakt brød. Det er mulig å bruke internett, for det er WiFi-tilkobling og på 80% av campingplassen kan man få tilgang til internett med egen laptop. Denne inspektøren besøker hvert år Campingplass Le Lac de la Liez og inspiserer campingplassen for ca. 200 fasiliteter og for andre punkt som forekommer. Inspektøren er en medarbeider fra ACSI og arbeider ikke for campingplassen. Lovely campsite with beautiful views of surrounding area. Only negative point was getting a table at the restaurant was a bit of a free for all with no system for keeping track of who'd been waiting for a table the longest. An excellent site within walking distance of a lovely lake. Views of the lake from many pitches. The out side pool has a marvellous view over the lake. Nice restaurant but poor service during our stay in June 2015. Very friendly staff with well stocked shop. Had a lovely pizza at the bar. Lovely view of the lake from the terraced pitches but they were a bit on the small side and water not hot enough for washing up. We arrived during lunch hour, read sign, use code, find pitch, report to reception later. We had booked and been issued a pitch as requested near to toilet facilities. Very good sized pitch area, with views on each side to lake, and over cabins on lower level. Good road system even for very large caravans. EXCELLENT reception staff, especially Joanna, ALL OTHER STAFF very friendly. Very clean toilet facilities, hot showers, May need to improve quantity of showers in high season, but we never had to wait. Lots of places to visit from info at reception. Lovely indoor pool, outdoor pool looked inviting too. Excellent patio are with excellent views. Lovely location with good gentle dog walks. Views from most pitches of lake. Excellent restaurant even early in the season. Nice mix of nationalities among the campers. We stayed on this site for two nights in June. It is a very large commercial site and most of the camping pitches are very small and I would think that it would be almost impossible to site a caravan without a mover. Also the roads between the pitches are very tight with large hedges. The lake views are very few and far between. You need to be on front line to see anything apart from chalets roofs and other caravans. One of the worst sites I have ever been on. If your idea of a good site is based on the shop, the bar and the swimming pool this is the site for you, but it is not for us. The lake is nice to take a walk by in an evening. A recently extended camp site with additional pitches but no additional toilet facilities. Very beautiful area and a fascinating historic town. Option to use own toilet shower on booking in as facilities are over stretched and needing maintenance. Terraced so great view of the lake. We arrived on a very wet day & unfortunately most of the vacant pitches were too waterlogged to even attempt driving onto. Having picked one, we attempted to drive our motorhome onto it but quickly got bogged down as the approach is uphill on the one-way system. We had to wait until morning to be towed off, but the staff were very helpful. Although there was a large toilet block nearby, which provided a roomy washing-up area in the centre between the male & female facilities, there was only one normal + one disabled shower and the only place you could wash your hands was in the washbasin cubicle, all situated round on the opposite side to the toilets. We made use of the indoor pool, which we had to ourselves and found this an ideal place to be on a cold, wet day & enjoyed a drink in the bar later. Vil du booke campingplassen Campingplass Le Lac de la Liez eller få mer informasjon? Det går bra med opplysningene nedenfor eller via campingplassens nettsted. 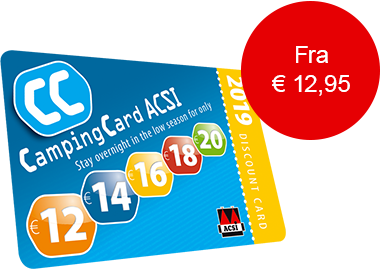 ACSI Eurocampings sender din forespørsel til "Campingplass Le Lac de la Liez".